He occupies a special place in the musical pantheon. 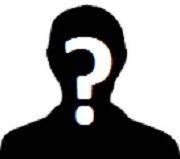 He's considered by some to be among the lesser of the greater composers and by others among the greater of the lesser composers. Both views have merit: his position leans toward the latter while retaining solid links with the former. 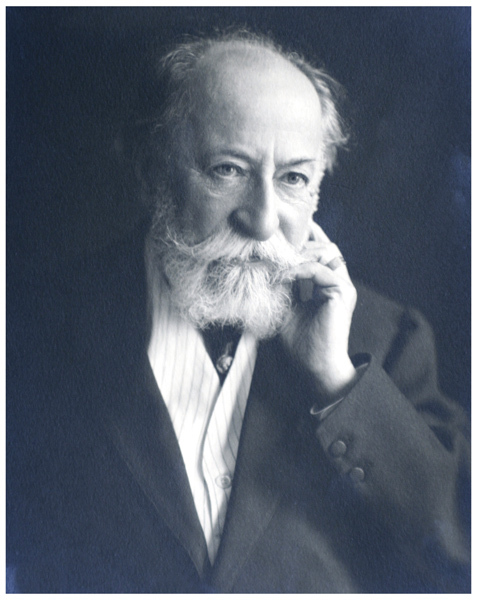 Many of his works remain in the standard repertoire of orchestras, singers and opera companies, pianists, violinists, cellists and other instrumentalists. French by birth, he was the first composer of note to write a film score, something which ultimately became an art in itself. In 1907 he was engaged to write special background music for the Film D'Art, Paris, production of L'Assassination Du Duc De Guise. The music, his op.128, was scored for piano, harmonium and strings. He was also one of the earliest-born musicians to make records which, though primitive by today's standards, reveal amazing speed and clarity in his piano playing. They are in every sense historic recordings, giving us glimpses into the character of 19th-century French pianism. The links in the chain that binds us to the world's history generally, and to our musical history in particular, seem larger and stronger when we hear these recordings: though he lived well into the 20th century, we're listening to the playing of a man born only eight years after Beethoven's death on the evening of Monday, March 26, 1827. In October, 1921, he attended a gathering at the home of the great musical educator Nadia Boulanger (she herself had studied with Gabriel Fauré), at 36 Rue Ballu in Paris. There, the elderly Frenchman shook hands with a 21-year-old Boulanger student who would eventually become known as the Dean of American Composers: Aaron Copland. Sometimes sad sequels show us we've done things not a week too soon: the older man died two months after this meeting. 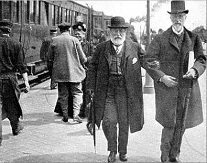 His most popular symphony, for a solo instrument and orchestra, was completed in 1886 (by which time Brahms, then the dominant musical figure in Austria, had already written his own fourth and last symphony). 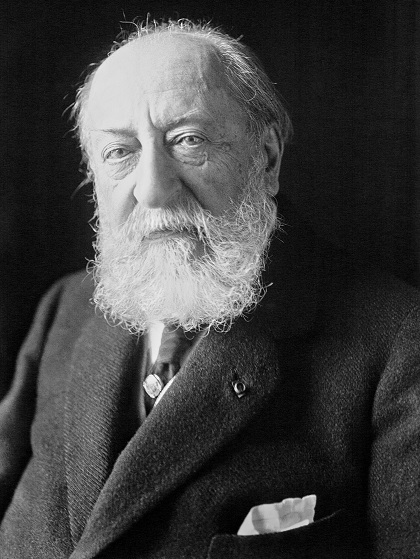 The piece this man composed was dedicated to Franz Liszt -- the Leonard Bernstein of his day -- and was arguably the most important 19th-century French symphony after Berlioz' Symphonie Fantastique nearly sixty years earlier. 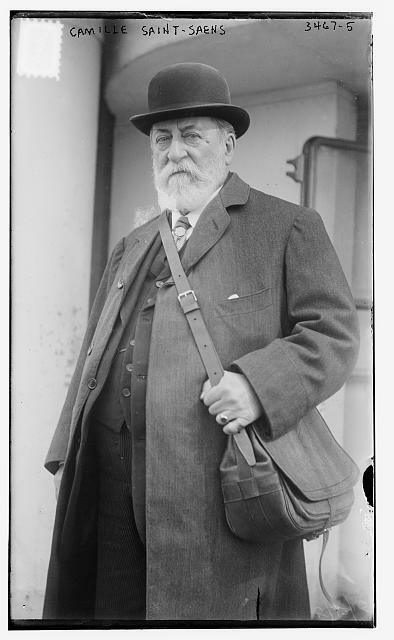 He visited New York in 1906, and San Francisco in 1915 as the official French envoy for the Panama-Pacific International Exposition. While there, Karl Muck conducted a performance of the symphony. 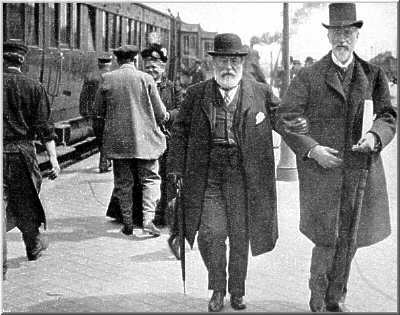 The Frenchman also met an American bandmaster known as "The March King": John Philip Sousa. A photo was made of the two of them. The elderly man composed a piece for Sousa's ensemble titled "Hail California." For the Carnegie Hall, New York concerts of the symphony, he insisted on playing the solo part himself at the performances. A now-famous photo, taken of him in profile at the instrument, shows him to have the appearance of a benevolent bird of prey, with a prominent Cyrano de Bergerac-like nose "which preceded him by a quarter of an hour" (as Edmond Rostand had written in his play of that name). 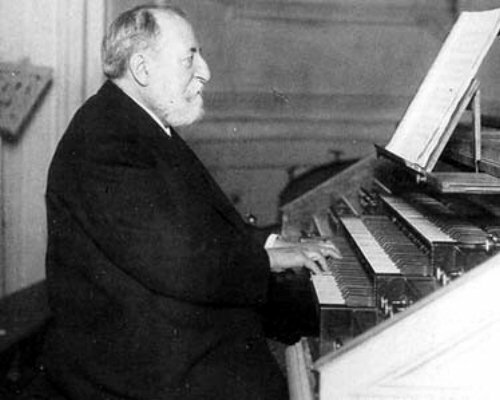 Liszt himself said this man was the greatest organist he'd ever heard. His manner when performing was described as "restrained, subtle, and cool; he sat unmoving at the piano. His playing was marked by extraordinarily even scales and passagework, great speed, and aristocratic refinement." The man's musical influence in performance style and bearing extended to other French musicians who came later, as exemplified by the late pianist and composer Robert Casadesus: he was the personification of pianistic taste, delicacy, elegance and style. The author of this article can verify this from personal experience, in having seen and heard Casadesus in rehearsal in the mid-1960s. 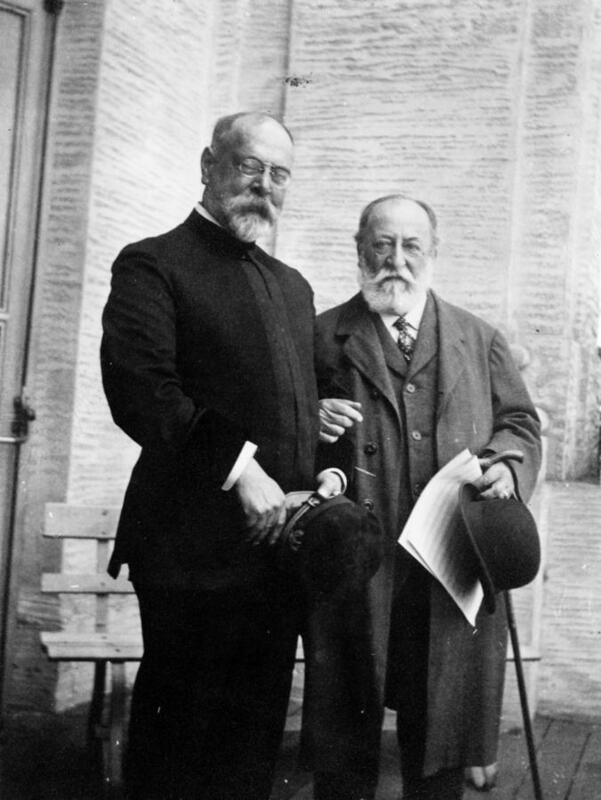 Twentieth-century legend says that the grand old man of French music participated in a scandále at the premiére of a work by a former student of Rimsky-Korsakov named Igor Stravinsky, whose ballet Le Sacre du Printemps (The Rite of Spring) was performed on May 29, 1913 at Paris' Théâtre des Champs Elysées. As soon as the piece began -- with a solo in the bassoon's higher register -- the now 78-year-old man stood up and exclaimed, "What kind of instrument is that?!" and stormed out of the hall. He was not at the premiére of the ballet per se but a year later at the first concert performance of the work. History is filled with composers whose musical facility even as children enabled them to scale heights seemingly without effort. To say this man had been a child prodigy would be an understatement of some magnitude. Writing music came to him "as naturally as an apple tree produces apples." He composed his first piano piece soon after his 3rd birthday (Chopin was still alive), performed in recital at age 11, studied at the Conservatoire de Paris, and was the organist at the Church of the Madeleine for 20 years. His music is characterized by unusual elegance, clearly articulated melodies and an ordered musical structure and style, and his piano playing was facile, amazingly rapid and clear. In these and other ways his musical facility corresponds to that of Mozart. He despised trends toward modern music and based much of his work on earlier composers, including Felix Mendelssohn, with whom he has many parallels as a man of great versatility. His interests were deep and wide and embraced philosophy, archeology, astronomy, history, geology and other fields, and his writings encompassed poetry and essays on musical and other subjects. A prolific letter writer, he achieved such renown and personal prosperity that he was able to live a life of creative leisure and travel, though he taught for four years, from 1861-1865, at the Ecole Niedermeyer. His extensive travels were often reflected in the titles of some of his works, which show the influence of his stays in exotic places. Those who studied with him may not have become important composers themselves, but those who knew him became important pianists and teachers, one of whom was Sigismond Stojowski; he taught pianist Alfred Newman, who was to win more Academy Awards than any other composer during the Golden Age of Hollywood. One of the Frenchman's most popular works was actually composed as a private joke for friends and colleagues and he never allowed it to be performed publicly during his lifetime. Conjecture may be fruitless but it's still fascinating: we can only imagine what he might have thought if he had known this piece would become emblematic of him in the minds of so many listeners. 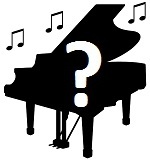 Beethoven, Rachmaninoff, Khachaturian and Copland each had such a musical albatross during their lifetimes with the "Moonlight" sonata, the Prelude in c-sharp-minor, the Sabre Dance, and Appalachian Spring, respectively. 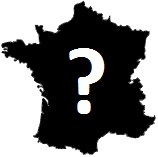 Such is the popularity today of this Frenchman's piece that one of its themes has been heard in an American TV commercial. Like Haydn before him, he had an unhappy marriage, and both of his sons died in childhood. He died in Algeria on December 16, Beethoven's birthday, in 1921. 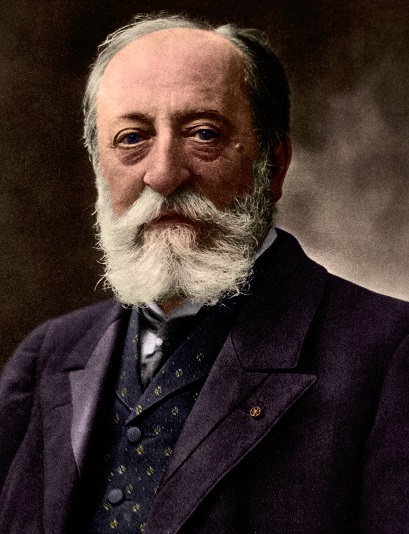 The obvious, by its nature, often escapes our attention, so it may be worth noting that just as a symphony is essentially a sonata for orchestra, Charles Camille Saint-Saëns was as alive then as we are today. Jeffrey Dane is an historian, researcher and author whose work is published in the USA and internationally in several languages. His book, "A Composer's Notes -- Remembering Miklos Rozsa" was published by iUniverse for the Rozsa centenary, and he has contributed to several other volumes. 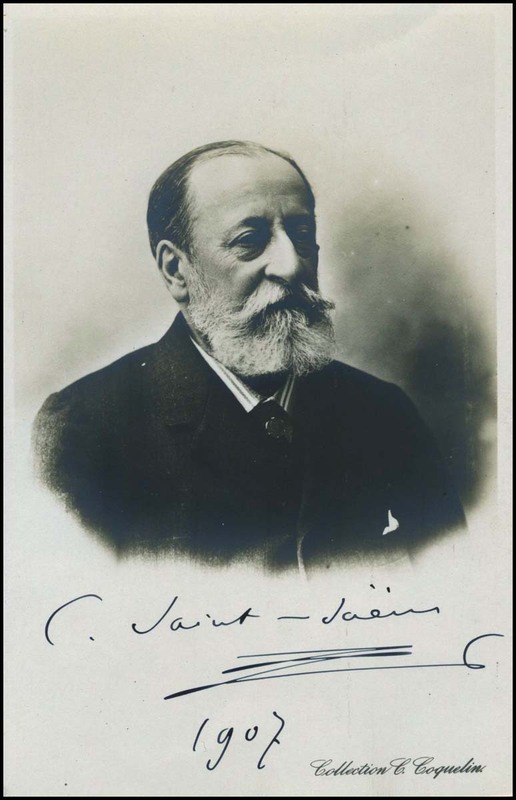 In keeping with Saint-Saëns' own example, he also pursues varied extra-musical activities, and has co-authored a just-published book (by Lauric Press in Allen, Texas), "Creating Texas: A Brief History of the Revolution."